Caption: Backpacking. Usual load 60-65lbs. We carried a spring balance. Water cooling system. 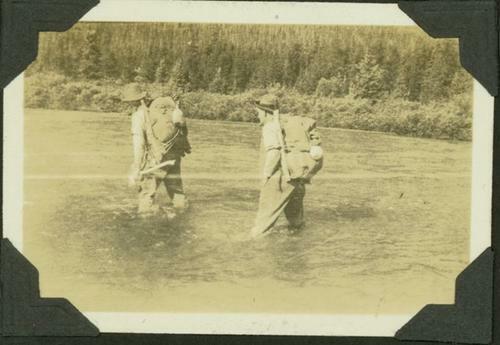 Item is a photograph of 2 survey crewmen trekking through water with packsacks on their backs. Metadata Elements for scanned image: Spatial Resolution - 1600dpi (master image); Signal Resolution - 8-bit colour channel ; Colour Mode - RGB ; File Format - .tif (master); .jpeg (derivative); Storage Medium - .tif (master) on Gold Mitsui CDRs ; .jpeg (derivative) on SQL server ; Scanning Equipment - Microtek Scanmaker 9800XL; Scanning Date - October 2008.